Have you ever wondered what wielding a real katana would be like? I know I have. And in Kyoto, you actually get to experience this, and you even get cut a goza mat with your katana! The experience takes place in a 250-year old samurai mansion, which used to belong to a high-ranking samurai who was related to the imperial family through marriage. The experience starts with the staff telling about the samurai mansion, the history of it and about all the symbolism you can see inside of it. Then you get to actually see the sensei (master), Masato Tabata, who will tell you about the samurai, Zen, and display some of his awesome sword skills. Before the experience starts, you change into the black kimono of the samurai. The kimono does not only look cool, it also hides the movements of your feet from your opponent, and it’s surprisingly easy to move while wearing it. Before handling a real katana, you get to learn how to handle a sword. You learn the posture, the steps, and the movements you need to make when cutting the goza mat. The most exciting part of the experience has to be this. You get to use a live blade to cut a goza mat, and if you get the angle right, the katana will cut through the mat like tofu. So satisfying. The last part of the experience is about Zen meditation, which is said to have been something the samurais also did in order to prepare themselves for battles. To get you into the state of mind needed for meditation, they use these singing bowls to create a soothing rhythm. 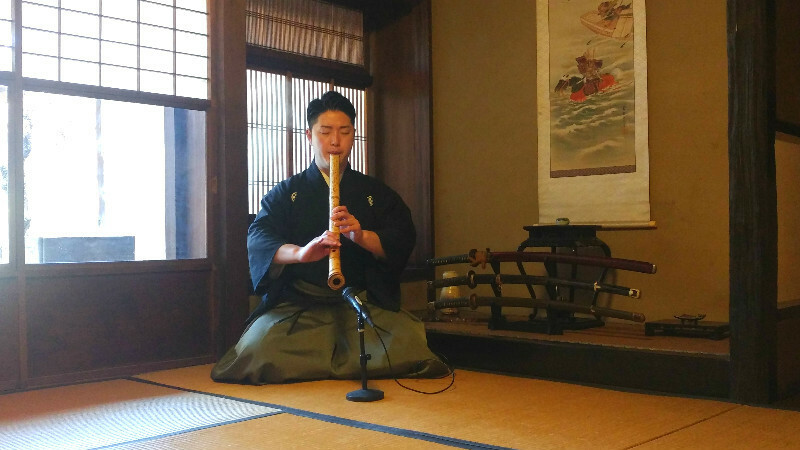 The experience ends with the sensei playing you the shakuhachi flute, which is also used in a type of Zen meditation called suizen. What I liked most about this experience was the part where you got to actually use a real katana. Just holding a live blade in your hands feels different; there’s a kind of exhilaration to the experience. And when you actually manage to cut the goza mat, it feels like a real accomplishment. The experience is something I can heartily recommend to anyone coming to Kyoto who is interested in the samurai. 080-4265-3100 *Direct number of the translator of Samurai Experience. A 5-minute walk from Hankyu Omiya Station, but they will come meet you at the station if you’re not sure how to get to the samurai mansion. The course takes approximately 120 minutes and is run twice a day, 10:00 a.m.-12 noon and 3 p.m.-5 p.m. Minimum two people per booking, so they might contact you to change the time you have reserved if you are the only one in that time slot. The two-hour experience costs 12,000 yen per person. You have an interpreter with you at all times!